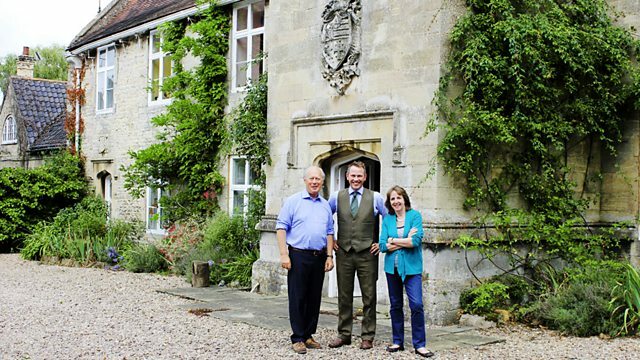 John Foster looks for antiques to sell to raise funds to save a historic house which survived an attack by Oliver Cromwell but is now threatened by structural problems. Browse content similar to Marston Hall. Check below for episodes and series from the same categories and more! belts are tightening as the deepest recession since the war bites. Well, Morgan inherited the estate just as the credit crunch hit. With heritage grants scarce, they are faced with a stark choice. It would break my heart to see those go. will they sell the family silver to save their stately? He's offering his expertise to try to throw these treasured properties a lifeline. All done at £15,000? All done. seat of the Thorold family, who are trying desperately to hang on to it. You feel you're letting the side down if you don't keep the thing going. persuade them to take the difficult decisions needed to save Marston? I'm a guardian here. I'll be here for 25 years if I'm lucky and that's it. With any luck, this building goes on, and it goes on with the history. one of England's oldest families. I'm just coming up to the village of Marston. I've been really excited to meet this family and, I must say, a bit daunted. that they've got the items and we can find the items to sell. owned a number of grand houses in Lincolnshire. But Marston Hall is their last link with this illustrious past. It has been home to the family since the 1300s. it would represent roughly every Thorold that's lived here. a surveyor from London who inherited the house when his cousin, Henry Thorold, died. everything was covered in that mould white bloom that you get on a bad grape. and their twins Ali and Guy. This is not following the rules, Mrs Thorold. was ours it was a pitch dark Saturday morning, pouring rain. I flicked the light switch and immediately fused the whole house. And I thought - is this a good idea? ..in the kitchen when we first got here. -It wasn't what we excepted. John is a chartered surveyor. But this house still throws plenty of nasty surprises his way. up into some of the wood, and it's, as you can see, perfectly rotten. or whether it's spread back into the room as a whole. that will be a few days' work and that's fine. we've got another big job on our hands. This damp is the latest in a long line of problems at Marston. that threatens the entire structure. The south-east corner of this house is moving. This part of the wall is moving outwards. and this very definitely needs money now. are crippling the Thorolds, but John can't walk away. and without much meaning to me. It's a cliche to say these things are in your blood, but actually they are. they urgently need to fix the wall and roof before winter strikes. -John Foster, nice to meet you. -Welcome to Marston. This is my wife, Liz. So how long has the Thorold family lived here? We've been here about 700 years. He looks down at me when I'm working there which reminds me of how to behave. I want to keep it in the family and going forward. So it must be quite a hard decision to actually have to sell some things. Well, one doesn't want to have to do that but really we have no option at this stage. -So pressure on you, and then pressure on me. -You're the short-term saviour, I think. and wealthy family of politicians, playboys and royal confidants. The Thorolds are eager to show John one picture in particular. I mean Rubens, big name. And so what do you know about it? -It's down in a family record as being by Rubens. as Circle of Rubens, and obviously there's a difference there. we do need to do quite a bit of checking. -Let's not put all our eggs in one basket is the key. I mean, I know there are other things to look at. -Why don't you have a look around? Well, if it is by Rubens then that's really good news. Peter Paul Rubens could make millions for Marston Hall. If it is an original. Massacre Of The Innocents made a record price of 49 million pounds. can reach hundreds of thousands of pounds at auction. But separating a good copy from a poor imitation is a specialist skill. The trouble is, artists like Rubens had so many followers after them because the style was so popular. People would copy and copy and copy. it may be, but it's almost certainly not. John wants to find other items that have a more reliable price tag. This really is an unbelievable chest of drawers. It would date from 1760.
his clothes on here for that final brush-off to make them perfect. you've also got its pair over there, which makes a massive difference. they could be worth up to £25,000. This is another lovely room, you can really see that they've worked hard. I mean it looks so homely in here. I mean, Gillows being arguably one of the top furniture makers of the 18th century. What's really nice is you've got a child's high chair. that this family included the whole family in dinners. children seen and not heard, I don't think applies in this case. and liked to show it off. That's a cellaret made by Gillows. all your bottles and this would have had a lined section. only the house that needed some TLC. it's obvious they're finding it quite difficult to cope with it all. And so badly looked after, really. Now for the hard bit. What will the Thorolds be prepared to part with? -So, tell me what you've found out. -Oh, well, it's been fascinating. I love this set of chairs, there are six, or is it just five? -No, there are more of those, a set of 12. Some of which aren't here. and one of the first ones in here is this cellaret. so I mean something like that I would estimate at £2-3,000. Did you see anything else that caught your eye? because quite clearly we have to get to our total. they would bump up the figures. -It's nice to have a pair. -Exactly, it's nice to have a pair. Then we go on to paintings, really, the Rubens. but I would like to just get another opinion on that. But that's not all. There's also the storeroom of paintings to consider. There are so many interesting paintings here. I'm curious to know where they all come from. built on the estate in 1760, very much grander than here. The family came into money then. -It had a wonderful library, a sensational one. The family gave up on it in about 1925 when it was pulled down. and they felt they didn't want to live there anymore. The contents on the other hand, quite a lot of it came here. -The Gutenberg rival sadly went elsewhere. a picture specialist here, we'll get him to go through all of the paintings. the leaning wall that threatens the future of Marston Hall. You can see it bulging out. You can really see that line there, can't you? You can, if you look at that gutter, that's vertical. normally, and this wall and the roof above it will be another £50,000 or so. -£50,000 on top of the £40,000 annual upkeep? -Yes. You heard that correctly. -That is a hell of a lot. and mediaeval architecture here requires constant work. To finance it in the future the Thorolds need a reliable income stream. So what's your plans then? It sounds perfect for weddings. there's a long story to it. -We will apply again, and I mean to get it. but so far no good. John Foster wants to move quickly with research into the chests and the Gillow cellaret. application to hold weddings at the house has been refused. and it's bang, smack in the middle of a really pretty village. You've got residential areas, and a really beautiful church. is called the Marston Thorold's School. Conveniently, you've got the pub across the road, the Thorold Arms. It just shows how important this family was to the area. on the grounds of, apparently, objections raised by local residents. noise late at night and also problems with parking. but until they do we really need to raise some money for them. Move the thing this way and it will catch it, come on. ...clearing up either house or garden. in London, leaving caretakers at the house. This has made it difficult for them to win local support for their business plan. They see somebody like me as an outsider or a Londoner. Actually, our family have been here for a while now. will happen anyway, it's not what we're looking for. everybody helping everybody else, that sort of thing. But you've got to feel welcome to want to do it. it's difficult to get everything done. There you are. All the rest will blow away. -No, I don't think that's a good idea. the urgent need to fix the wall and the roof remains. to see if the paintings can help. and they want Rupert's view on that straight away. and we've got to decide whether it's right or not. ..you see, I'm afraid I don't think so. -Do you think it's of the period? that they went to the pub together or something. Well, that just isn't the case. It's, I think, a copy. In fact I think it's a straight copy of a known picture. -How can you tell, that, Rupert? I think the first thing to say is that we've got some clunky figures. They are slightly clunky, all of them. It seems to me they're not lively, and naturalistic enough. I'm so sorry if that's rather disappointing. but life doesn't necessarily turn out that way. The study, piled with paintings, may yet produce a real old master. If Rupert can find them, beneath the Christmas decorations. -Are you happy if I just rustle through? Rupert's eye is immediately drawn to one painting. So I think this picture is meant to be a Rembrandt. What we've got to decide is how close to Rembrandt it is, in fact. Studio of Rembrandt or Circle of Rembrandt or it's Manner of Rembrandt. or 200 or 300 years later even, and nowhere near the real thing. Always go to hands. Artists find hands difficult. like chipolatas that have been defrosted rather too quickly. That's definitely Manner of Rembrandt, then. These are meant to be by Teniers. that should be I before E, and it isn't, it's Teneirs. but in families like the Thorolds that's normal. and you quite consciously bought copies, not the real thing. You'd do this simply on grounds of budget, you couldn't afford the real thing. There was no fakery going on. it's actually not very good, I'm afraid. people buy them for the same reasons, they want to decorate their houses. every time you're looking at one of them, something like that. Will there be anything of enough value in here to really boost the funds? because I've had my eye on it since I came in the room. The thing is, it's good. I don't think there's anything particularly special, but there was this. -the condition is really quite parlous. Country house condition, well put. Having said all that, I thought I saw some quality in this picture. Other than it's a family member actually not a great deal. of all the famous Scots at the time. if it was a Raeburn? put it this way, it's just possible it could prop the house up on its own. -That would be seriously pleasing, actually. But Rupert sounds a note of caution. I think that that date of 1824 is very late for it to be Raeburn. I'm not even sure if that isn't after he died. Well, we've got to show it to a Raeburn specialist. That's got to be done. If he gives it the thumbs up it's all systems go. This could be exciting news for the Thorolds. Sir Henry Raeburn was the most prominent portrait painter of the late 18th and early 19th century. depending on the sitter and the style. of thousand, to over a million pounds. Raeburn died in 1823. The painting is dated 1824. But it's just possible that it could be authentic. A Raeburn specialist is needed to be certain. The damp issues in the dining room have got worse. John has called in his builder, Glynn. back to the bare floor, as much as we can. You're looking at the best part of £1,500. -Yes, I dreaded the thought of that. ..otherwise it could be quadruple that. he's left the celebrations at home to fix the floor at Marsden. but I don't really know what to do about it. maintenance now on and off for the last 15 years. starting from the roof downwards, to be honest with you. And now we've got the floor problems. It must be hard for him. It's just a constant drain for him to try and find, obviously the money. We will go and spring this on Glynn. -Right, Glynn, can I interrupt you for a few moments? for something like 23 years between my mother and myself. -Yes, it probably is now, yeah. A small amount of drink. And that will get you two Premiership football tickets. You'll have to arrange it. No, we deeply appreciate what you've done. -That's all right, I'll see you next week. So the floor's fixed, but at a cost. and the roof may lie with the Raeburn painting. John's consulting a world authority, Dr Duncan Thomson. Will he be able to solve the mystery of the date? The painting is signed 1824, but Sir Henry Raeburn died in 1823. Dr Thomson, this is John and Liz. -Hello, how do you do? It looks wonderful in this light, actually. We've swung it towards the daylight and it really benefits from being seen in daylight. but delicacy in the young child. -I don't doubt whatsoever that it's by Raeburn. I see Raeburn's typical handwriting which is very delicate, fragile. -..show through the muslin, there. -And the face is so sensitive. And what about the date? Well, I should think the date represents the time the family got the picture. It came via the Raeburn Studio after Raeburn had died. I mean you've obviously seen a lot of Raeburns in your time? certainly among the fairly large number of paintings he did of children. a sudden minor earthquake bits of that would fall off. And how is the market for paintings by Raeburn at the moment? but I know of other Raeburns being valued at over one million pounds. Why is there such a vast range in prices? I think there was a feeling that Raeburn was careless, he was over-productive. he was painting too many portraits and an element of carelessness crept in. I think this fits in the middle somewhere. -You mean half a million? Right. Well, between the £2-3,000 and the half million. It's encouraging that the painting is authentic. and how to price it. Marston Hall needs a cash injection just to keep it standing. which Liz and John are keen to develop. very well, cos it's a good size lawn to have a certain number of people on. so if it's windy they won't lose their hats. virtually no noise can be heard the other side of it. beds and all that sort of thing, so all this is still relatively new. really struggling with a gardener once a week for a couple of hours. The wedding business is on hold. But John Foster is keen to get the 18th century chests valued. to help decide their worth. If they are a genuine pair they could make up to £25,000. How are you getting on? I see you've had a bit of a move around. -whether they were a genuine pair. In fact they're not, they're very close, but one is slightly smaller than the other. for another of the same model. My guess is these were made about 1770. There are no carved elements, there's no inlay. than have the carved styles and the big ormolu handles. I mean does that say anything about the family that owned them? that is interested in quality. They're not interested in something that's flashy. They want something that's good and they're prepared to pay for it. I think that tells you a lot about your ancestors. you see above my desk refused a peerage. Which was unusual. in the 18th century sense. I must confound you on one small matter, he was a wig. He was a wig, was he? -What date are we talking about? Absolutely perfect for these, yep. were owned by that man. You know? but he still needed somewhere to put his socks. And here they are. The ninth baronet could afford plenty of socks and fine furniture. and rebellious MP for Lincolnshire. -With restoration of them, do we leave that? -That has never been touched. The worst thing you can do is have that polished off and restored. Selling them in their original state, can only really help them. It can only really help them. In fact, what the trade likes is goods that are fresh to the market. And so these have not been sold, probably since the day they were bought by your family. a lot of excitement at auction as a near-pair. He's identified a fine furniture sale in Edinburgh. But first, he must agree an estimate with John Thorold. I would like to put them in at 12 to 15 or even £18,000 as an estimate. That's still a tempting estimate, which is the way I like to do things. I think we can get them into that sale, we could be onto quite a good one. -I think it's a very realistic contribution to the problems I have with the house. to sell both of the serpentine chests and the Gillows cellarette. were commissioned by Sir John Thorold, ninth baronet. Because he was the man largely responsible for building Syston Park. so it's no wonder they needed new furniture. but sadly, it was demolished in the 1930s. so he's going to Tatton Park in Cheshire. could afford the very best. The library at Tatton Park is a fabulous example. This is the best place to see Gillows at its absolute finest. for this room, including these quite staggering bookcases. Only the best craftsman were employed and the best materials used. including a rare Gutenberg Bible. was sold at auction in the 1880s. John has found a remnant of that library here. They've got the label there "For Syston Park"
and lovely, as well, that they've got the Egerton family label in there. And this just shows how important the library at Syston was. Syston was furnished in exactly this style, offering the last word in luxury. Imagine that full of ice, champagne, wine bottles. It would have just set the tone. and was demolished in 1934. Saving Marston from the same fate means tough choices. and paintings from Syston are now at Marston Hall. And John Thorold is having to decide what he must let go. and the Gillows cellarette to auction. I'm a little sorry to see them go. But you know, we have to adapt. That's how businesses survive and that's roughly how I'm going to survive. If that's necessary, this is what we do. to a specialist furniture sale that John Foster has recommended. when it eventually passes to Guy. So, what do you think about selling stuff for the house to keep it going? I don't know, it's not something that's ideal. -In terms of the short-term, I guess that's really our only option. In the long-term, what do you feel about keeping it and running it? which is a great house to have with your family name attached. because others before have kept it. -because 750 years have passed whilst we've had it. because I'm not the one that's going to inherit it in the end anyway. and it's going to be your children who would get it. I'd want to put in. -You're like, "I want your money". should now be with an auction house in Edinburgh. proved too much for John Thorold. It started in the course of the evening, it rather prayed on my mind. And by about 11 o'clock that night I realised it was something I wasn't going to do. and I'm afraid it came all the way back down again. Having thought about it, I'm quite pleased I did that. In the end, the value of things is not the financial value. but it's how any object absorbs human influences around it. You know, what's a house? that's all it is until a human comes to it and makes it into something better. who is coming to the Hall. He gave me some very good advice. And I haven't taken it. And we will see what he says. -So, I hear things have changed a bit, John. -Um, yes. They have, I'm afraid. This was something I wasn't expecting to see. No, I've gone straight against your advice, I'm afraid. I simply didn't want to get rid of it. To be honest, I think it's crazy to split these chests of drawers up. That's where the money is, is the fact that they're a near-pair. is that it has a significance. It isn't just "What's it worth?" John, you've got a wall which is falling out of the end of the house. ultimately, at the end of the day, you've got to raise the money, John. is that it's not here looking pretty. because it's quite a big shortfall. How are we going to...? I think we may have to look at other things. with a reserve of £5,000. Even though selling both together could fetch 15-20,000. In Edinburgh, just a few days later, the furniture sale is happening. to make a reasonable sum with a reserve of £5,000. 2-1, 2-2, £2,300 I have. 2-4. 2-5 now. Nope. 3-6.
serpentine fronted chest win bids? George III mahogany serpentine chest of drawers. The bidding starts of £4,200. -Then a few bids push the price slowly up. But only just above the reserve. Are we sure? At £5,200, last chance at 5-2.
then one would feel excited, but somehow, with a reserve of 5, to just get over. So maybe just as well we've only sold one. -John's not going to agree with that. I still disagree. Nice try. Thorolds' Regency past. The rosewood cellarette by Gillows of Lancaster. Nice looking piece, this. Let's get started at £800. -And this time, there's a bit of a fight. It flies up to 1,600, but will it keep going? Are you all done? Any advance on 1,600? I will sell then to the lady at the back of the room, selling at £1,600. Though it has sold for £600 more than its reserve of £1,000. -I think it's pretty good. -And at least there was a bit of battle. Makes it more exciting, anyway. Definitely. Right, I think we're done, have we seen enough? Let's get out of here. The total made is £6,120. its value is the next issue. and has made a surprising discovery. this painting sold for at auction in 1995 and that's not so good news. So, I've now got to break this news to John. and I've actually found, believe it or not, its twin. -That's quite clever of you. This one is the twin to it. and in the catalogue it talks about who's in the painting and the date. This is actually a better painting, commercially. This one, sold in 1995 for £8,000. to work out how we do this one. What I would like to put this in at is 10,000 to 15,000. My difficulty is that I know what the probate valuation was. -What was the probate valuation? -I think it was around 30. You could put it in at 20,000 to 30,000 or even 30,000 to 40,000. My gut feeling is it won't sell. What about if we put it in at 15 to 25? I'll be here for 25 years if I'm lucky, and that's it. With any luck this building goes on and it goes on with the history. That's really the important bit. And that is really the dilemma. and see if we can put a reserve on it of 18,000. -Yes, I think I would be quite happy with that. There's other paintings, John, that Rupert's identified. Which ones in here then would you be willing to let go? so I don't have any reluctance in letting them go. The Giorgione up on the wall. If we get those checked and then I'll give you a call and we can work out...? -Yes, I think that would be the best way of doing it. which Rupert has valued at £1,000 to £2,000 each. And he's agreed to set the Raeburn estimate at a high £15,000 to £20,000. for more items to boost funds for the wall and the roof. Another relic from Syston Park has caught John's eye. This really is an amazing clock. It would date from about 1895, 1900-ish. And the quality of it and the size of it, it's massive. It will raise quite a bit towards our target. The Thorolds really need to sell more antiques. Can John persuade them to let go? It is a handsome mirror. it's bang on period Regency 1820-ish. And with these lovely branches, they're quite sought after things. They're sort of sphinx, aren't they? -Yeah, that whole Egyptian theme was really hot then. What would you think about selling something like that? I must admit, I think I'd like to look elsewhere in the house. we've got to look at. I know there was some issue, before. It's something on which I would very much like to involve my son. has developed an attachment to some of the pieces. -You two are the deciders on the clock? Why are you so attached to it? I think it adds a lot to the house. and it should have something like a grandfather clock in it. -And do you think the same? I think it's a classic thing to have in a house like this. but you can only have one grandfather clock. But, it's 3,000 to 4,000. That's quite a chunk of money. So, are you dead against selling it, can we twist your arm? -I think we're dead against it. You're as bad as your dad! to the wall and the roof before winter. that the estimates on the Raeburn are too high. who will sell the paintings. He's been examining the damage on the Raeburn. How bad is the condition? You can see it's pretty bad. It can be sorted, but at quite a lot of money. and basically, stabilise all this loose paintwork. I am dying to ask you what you think it'll make. -My estimate, would be in the region of £7,000 to £9,000. -so we're in the same ball park. it will kill it dead. No one will even come to see it. Yes, it will. This has happened before with pictures. to lower the estimate from £15,000 to £20,000, to £10,000 to £15,000. his planning application to hold weddings. It's not a permanent idea. to the number of people you are allowed? upper limit of the number of people you can fit in the Great Hall. who have been working on their planning application for three and a half years. because it's just hung over us for too long. to keep the place going. the side down if you don't keep the thing going. I was talking to Guy about it. Will he be able to afford to keep this place going? He won't be able to run it. if we can't ever do anything to make it pay for itself. It's the day of the painting sale in Yorkshire. There are six paintings here from Marston Hall. this is their last chance to raise enough money to save the wall. -All right, Liz, hi John. -Hi, John, how are you? Though there's rather more to feel apprehensive about, isn't there? -This is the biggy, isn't it? There are quite a lot of things coming up. -There's a good buzz, here. It's alive. 850, on the telephone, selling now! First, there are the five Old Master copies up for sale. John is hoping that together they could raise up to £10,000. There's a real buzz in the room about these paintings. -Well, there we are, got it. AUCTIONEER: Last time then, selling at £850. The last of the Old Master copies to go under the hammer is the Rubens. Will it go above its reserve of £2,500? 1,000 bid. £1,000 only bid. It's off to a good start with two bidders competing. The bids race up to £2,600. But will it go higher? last time, selling at £2,600. The Rubens copy scrapes over its reserve, selling for £2,600. so it is quite tense in here. but all is now resting on the Raeburn. AUCTIONEER: And I start the bidding at £5,000. To save time, a 5,000 bid. Again, bids come thick and fast and the price climbs to £8,000. The last time then, selling at £10,000. But it's still 10,000 towards the wall, isn't it? because it's mostly its poor condition that goes against it. -It sat in a very damp place. -It is a lesson to us. and the Old Master copies have boosted funds. John is heading back to Marston for one last visit. I don't know about you, but I found it quite a tense day at the auction. and think about it all? I actually felt in the end we were very lucky. the prices that were suggested. -And of course the condition was so bad. It was a bit of a nightmare even getting it there, wasn't it? Wondering if the paint was mostly going to be in the back of the car. No, I think it was good, I think they did us jolly well. I really do, I think it went well. we didn't get close, really. After commissions were paid, we got to just shy of £22,000. It's all a help, isn't it? I can cope with now. that part of the building but I got enough to keep going. What is more important is that other things have started to move forward. and they've said they'll come and have a look at the problems here. -So at least that's a start. And have you made progress on your plans to hold weddings here? it's slightly reduced from the original one I did. which is what you must do with a house of this age. You must keep me posted as to how you get on. Well, thank you, you were terrific. We are genuinely, extraordinarily grateful. act as a reminder of how important it is to save these treasured country houses. and I wish them all the best for their future here. Marston Hall has survived an attack by Oliver Cromwell, but is now is under threat from structural problems. John Foster helps the Thorold family raise funds for its upkeep by finding valuable heirlooms they can sell.